The Fortress of Solitude. The Epicenter of Good Vibes. The Hedonist/Hermit's Hideaway. The Most Serene Monarchy of Mikie. "Observe the marvels of my world" said the wise man. "You can not trust a man if you don't know his house." The sense of Place draws me as near to the beach as possible. 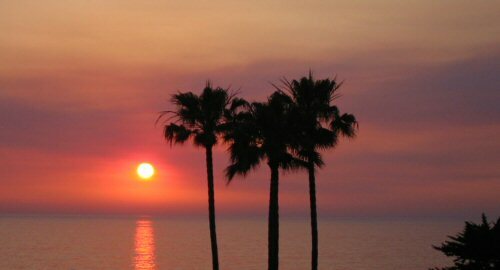 For 25 years I rented homes directly on the cliffs overlooking the Pacific. I rented because 1. I never saved enough for a down payment to own 2. I always wanted to keep my life free of long term commitments and 3. any place I wanted to live (oceanfront) was way more than I could afford. As a result of the sale of my software company, I was finally able to buy a place of my own. But I put that off until I burned through a lot of the dough on depreciating toys like Ferraris and airplanes. But those stories are told elsewhere, this is about my home. Now at last I have become a home owner instead of renting. And with ownership comes the ability to make a home more to my liking than would be allowed by a landlord. For instance, a homeowner can move, or remove, a wall, and install new plumbing, lights, appliances, windows, and paint. 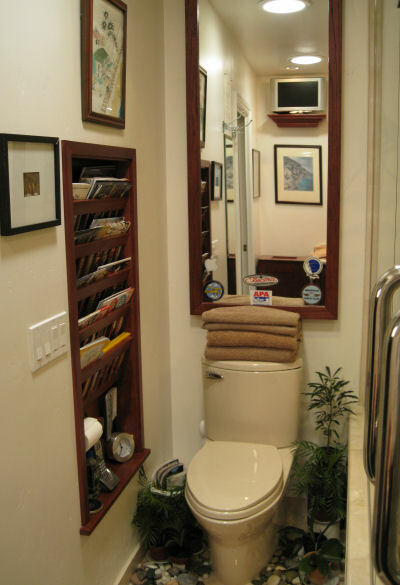 Such simple improvements can make all the difference in the overall enjoyment of a Home. so that every moment spent At Home is a moment of extraordinary pleasure. The Vestibule You will remember your first impressions of Mikie's Fun House! Check out the Front Door! Exercise Area This is where I exercise body and brain! High Security Details available on need-to-know basis. Help Even hermits need help. Learn the secret of my success. Friends and Family The Fun House comes alive with visitors. For three years I lived here without a fireplace, all the while scheming and planning the perfect setup. When I finally did the deed, and installed the fireplace, I was amazed that I had no plans for what would go on the mantle! That didn't last long, however, as you can see. I've gone through many iterations of "stuff" for the mantle from very crowded to very simple and prefer the clean look. Now, all I have is a model of the biplane I flew for 7 years, and a Zen clock that strikes once per hour, against the bowl. To the left is my cue case, to the right, a few pool cues. 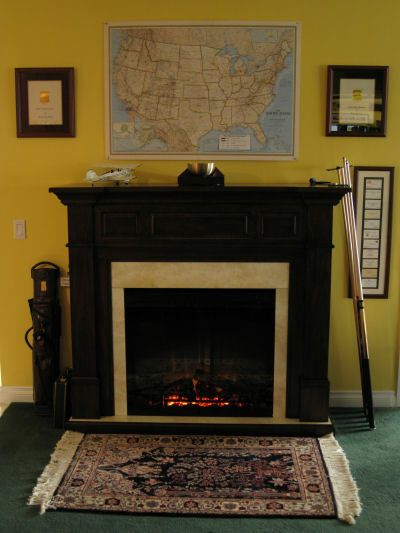 Above the mantle is a map of the USA, showing the routes of my many long, nomadic flights in the biplanes. To the left and right of it are the Inc. 500 awards for 1991 and 1992 for running one of the 500 fastest growing privately held companies in the US. Condo associations are restrictive on what you can do when you remodel, and one of the big things that you can not do, is to change your front door in any way. Everyone's front door has to look exactly the same. Boring. But Mikie's Fun House needed a special front door! After much thought, and years of planning, my cunning scheme has finally borne fruit. Visitors are welcomed into this private space filled with plants, water, candle flame, and soft music from hidden speakers. A padded bench encourages the visitor to sit and remove footwear and stow their shoes out of the way in the woven baskets provided. The stained glass image is a custom original design by Tamara at Cast Glass Images of San Marcos, CA and perfectly crafted by Michael, the owner and artisan extraordinaire. The door itself is made of solid cherry, and a one-of-a-kind creation by the awesome craftsmen at MZ3D Custom Furniture Design & Production Inc. , with special thanks to the owner Roberto Mendez, whose extraordinary skill is at the highest level. 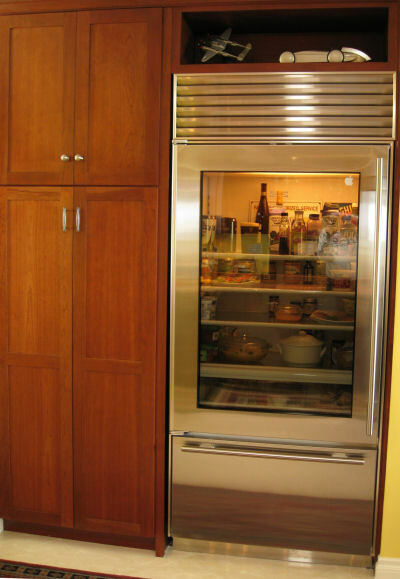 It's a "Dutch" door, whereby the bottom and top halves are operable independently, so the bottom can stay closed while the top remains open. Notice also the transom that gives extra flow through ventilation, while retaining privacy. All things considered, it is spectacular! The centerpiece of the living room is this pool table. I've been spending a lot a time playing pool these last few years, and you can catch up on the action at my pool blog "Diary of a Pool Shooter" - The Adventures of Fast Mikie"
Also notice the hammock (from Exotic Hammocks) on the balcony. 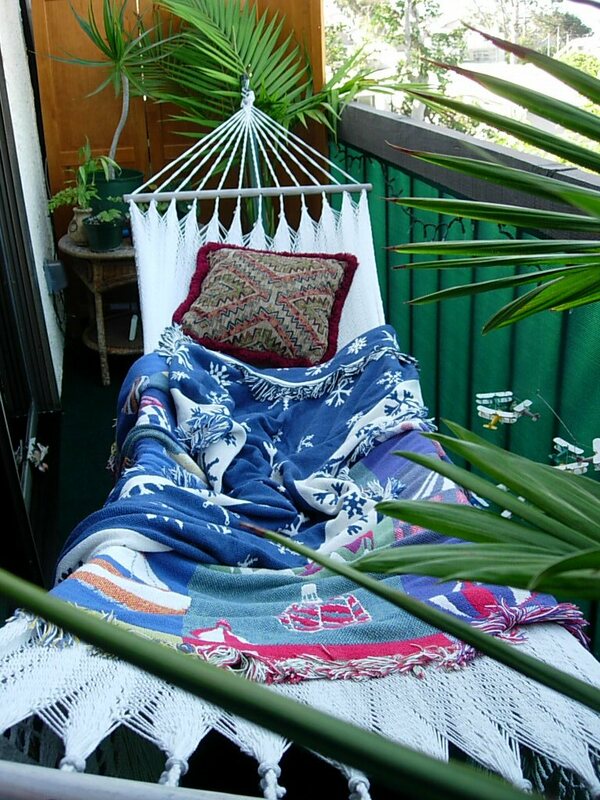 Time spent lying in a hammock is not subtracted from one's lifespan, I am sure of it. If I can stay awake while relaxing in the warm afternoon sun, it's a great place to ponder the meaning of life. I recommend "Hammock Therapy" to everyone! This hammock is slightly angled so I can watch TV while lying in the hammock, through the open sliding glass door separating the living room from the balcony. Entertainment Center. 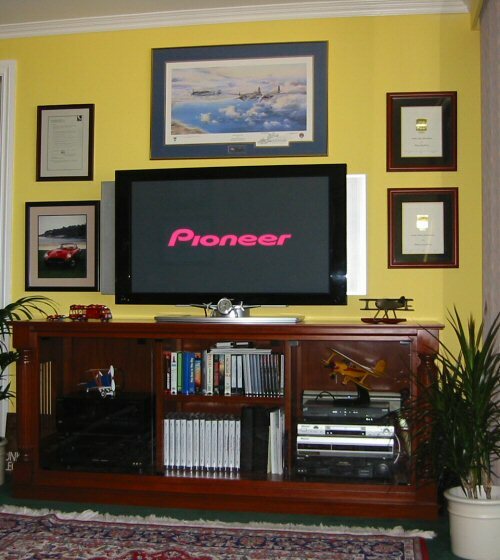 Pioneer 43" plasma HDTV (#PDP-4340HD) driven by Dish network Satellite system, plus TiVo-like DVR, Pioneer DVD player, Sony VCR, Sony CD player, and Sony AM/FM Receiver. The cabinet is an original Double M design, executed in solid cherry by Armstrong Woodworks. The Kitchen. Appliances include Bosch stainless steel dishwasher, Dacor microwave and Dacor electric range with touch control (no moving parts). The refrigerator (see photo below) is out of the photo to the right. The cabinets are cherry. The framed Smithsonian print shows the 1957 Ferrari Testa Rossa, V-12, of which only 19 were built, and one of the loveliest shapes ever sculpted into moving metal. Notice the Solatube skylight, by Brighter Concepts. The added light makes a major improvement. 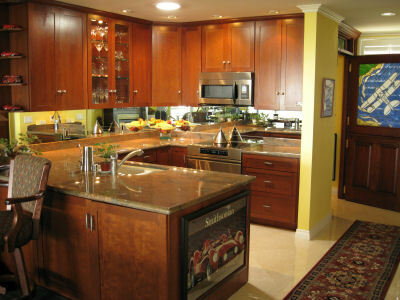 The mirrors under the cabinets also make the kitchen brighter, and feel a lot roomier. To the right in the photo is the new front door, with stained glass panel. The refrigerator is one of my favorite toys. May I present: the new SubZero model 650G, (7' tall, 3' wide) with a glass door, which offers the ultimate proof that the light DOES stay on when the door is closed. It also gives the kitchen that homey "7/11" convenience store ambiance. Here's a photo of the computer system wall of my office. 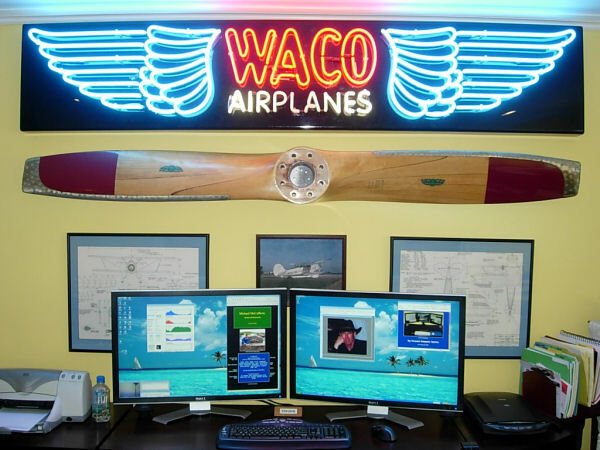 The neon Waco Airplanes sign (8' x 1.5') was hanging in Mikie's Fun House #2 (the airplane hangar in the desert), and has been waiting for a couple of years in storage to be the center of attention here at Mikie's Fun House #4. The prop is from my European Biplane Tour. After returning from that 3 month adventure it had absorbed a bit too much moisture and got itself out of balance and needed to be replaced. That was just fine with me, because I always wanted to have one of these awesome props for my wall. The dual Dell 30" monitors for my computer systems are the best computer investment I have ever made. Behind the monitors are three framed items: The center frame is photo of my first open cockpit biplane, taken on the day it was completed by the factory... the first time it was rolled out into the fresh air. The flanking frames are engineering drawings of the Waco YMF-5 (the one I flew). Just inside the office, to the left of the entry, is the hidden prize, a large Grandfather clock. To the right, out of the photo, is a window to the ocean view. The Guest Bathroom. The stone is filled Travertine, in 12" squares, set diagonally on the floor, and stacked on the walls. The shower curtain rod is solid cherry. On the wall, just above the loo (Toto, with no-slam lid), is one of my favorite paintings: Hylas and the Nymphs by JW Waterhouse. 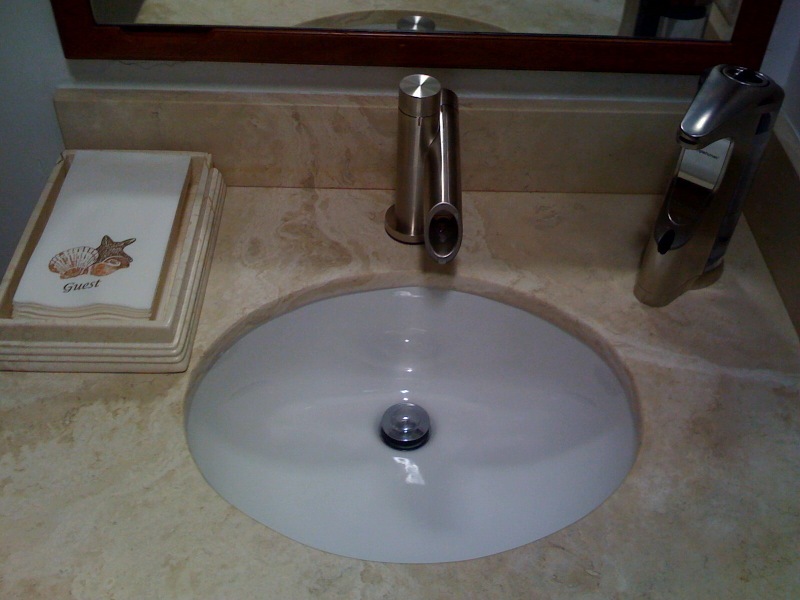 The sink in the guest bathroom, Installed just a few days before Christmas, 2008, this faucet is completely automatic. Just reach out and the water will flow. 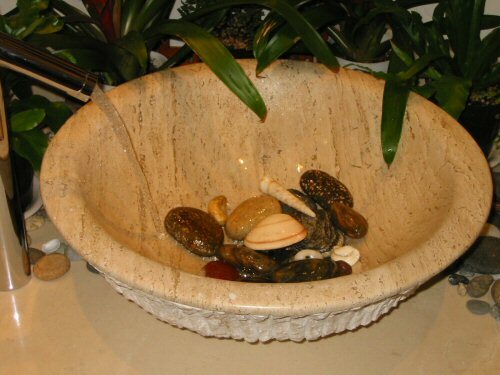 There is no need to touch it at all, as the water temperature is preset to a comfortable warm, and the flow is ample. It will shut off automatically. Faucet by WaterDecor, more info here. The counter top is Travertine slab, cut and fitted by Frank Sciarrino, an old world artist with stone. He did a lot of work on the Fun House in the desert. 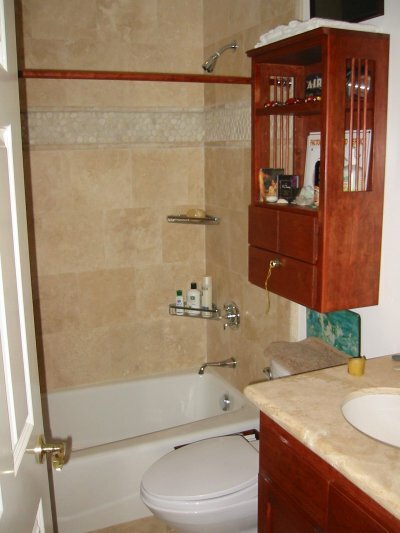 All of the cabinetry, and even the shower curtain rod, is solid cherry, built by Armstrong Woodworks in Carlsbad. New bed, bookshelves and cabinets custom designed (by Mikie himself, of course) for the latest Fun House, and executed in solid cherry by Armstrong Woodworks, Carlsbad. The foundation of the bed is a cherry cabinet with drawers for additional storage. The cabinet at the foot of the bed is a Chinese design, constructed entirely without any metal staples, nails, or screws. 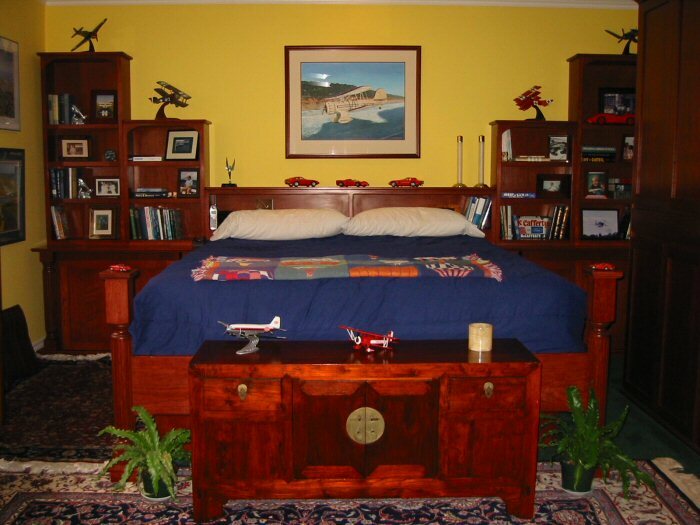 The painting over the bed is the Waco open cockpit biplane I owned, when I was adventure-flying the USA and Europe for 7 years. For more detail on this painting, click on my art page. The models on the shelves are, from left to right, P-40 Flying Tiger, Sopwith Camel biplane, Ferrari Daytona, Ferrari 330 P4, Ferrari 250GTO, Red Baron's Fokker Dr-1 triplane, and the F-4U Corsair. 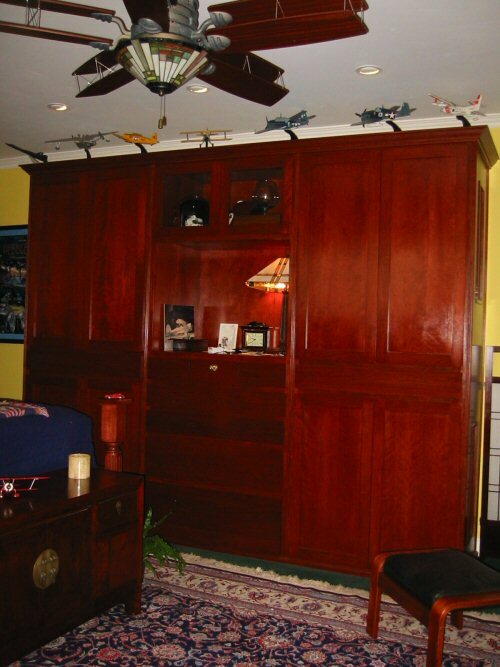 The master bedroom features a huge (7'H x 9'W x 2'D) solid cherry armoire, (also built by Armstrong Woodworks) topped by the model airplane collection. The ceiling fan, with the biplane wing blades, (how could I resist?) 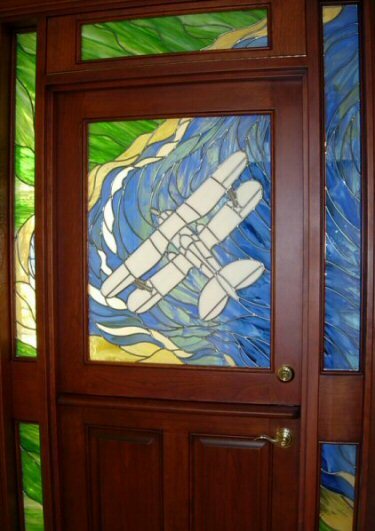 is the Kitty Hawk model by Emerson, with custom stained glass light fixture. 30" Dell wide screen TV/monitor so I can watch all the pool videos on TV that are automatically recorded so I can play back anytime later. The monitor is also connected to the Windows Media Center (under Vista) so I can get any pool videos on the internet too. And the PC (HP) has DVD, DVD-HD & BlueRay so I can put up any of the videos in my pool library. The treadmill is a Vision Fitness T9450HRT. Overhead is a padded Everlast pull-up bar. 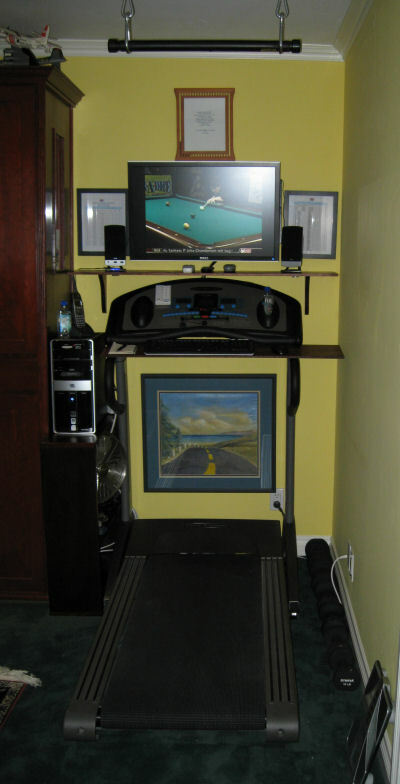 To the right side of the treadmill, on the floor, are dumbbells of various weights,and a scale that gives readouts on body fat percentage, metabolic age, etc The shelves hold all sorts of remote controls for lights, heat and fans. Also, water, telephone and notebook to record progress. The frames on either side of the monitor show the final standings on two of my undefeated seasons (2005 and 2007) to serve as additional motivation. In the frame above the monitor is a modified quote from Og Mandino's Greatest Salesman in the World that have been an inspiration for the last 25 years. The monitor is on a movable arm that swings out 90 degrees so I can watch from bed. I think I'm close to treadmill perfection. Maybe the next step is to build a shelf for all my pool trophies. The Super Shower is a real treat. The BainUltra Thermo-masseur over size Jacuzzi-style tub allows fully reclined, fully immersed bathing. The ceiling mounted rain shower head, at 7' high, provides a downpour on demand. The Grohe Sensia Hand Shower massage head gets in all those hard-to-reach places. For extra fun and good health, there's a Roma' steam unit. All fixtures were provided by European Bath & Kitchen. Ask for Suzi Banks! Once inside the shower enclosure, I can still easily and safely control (including dimming) all the condo's 40+ lights and fans, using the X-10 remote control system. I simply put the control unit in a plastic baggie! 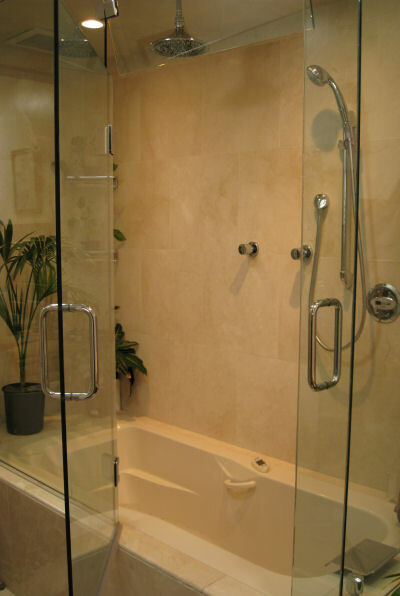 The entire shower area is done in a very light ivory/taupe Italian Crema Marfil marble. The 18" squares are set diagonally on the floors and stacked on the walls. It's very nice stuff, and I got a great deal on the material. The same material is used for the floors in the entry, hall and kitchen. 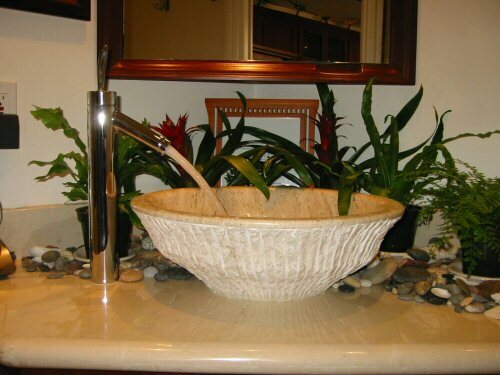 Above photo shows the hand crafted Roman style sink, created out of a solid block of stone, polished on the inside, rough-hewn on the outside. In the upper right of the photo is the Phillips HDTV viewable from all vantage points in the bathroom. Below the HDTV is a photo of Positano, Italy where I vacationed for a few days a few years ago. Reflected in the mirror is a map of Ireland, circa 1650. The airplane model is the 1939 B-314 Pan Am "Dixie Clipper" trans-Pacific luxury passenger 4-engine flying boat. I will be master of my emotions. I will multiply my value a hundred fold. It has been my daily meditation for more than 20 years. Roman sink detail. Includes a small collection of some of my favorite beach stones and shells. The many stones you see in the bathroom area were all found, one at a time, over many years, on walks on the beach, mostly locally, but some from as far away as New Zealand. The library annex, periodical department, with built-in magazine rack and loo. The rack also holds clock, telephone, note pad, pens, and remote controls for lights, heat, TV, fans, etc. The loo itself is a Toto, with SoftClose feature "to eliminate that annoying Toilet Seat Slam". The same unit is used in the Guest Bathroom. The magazines are: Wired, Fortune, Fast Company, National Geographic, PC, Pool & Billiard, Billiards Digest. 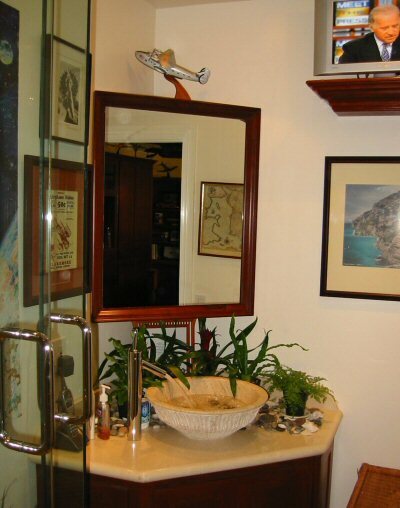 The mirror was custom built by Walter Lilly. The magazine rack was custom built by Steve Armstrong This daytime photo clearly shows the amount of light entering through the two SolaTubes that easily provide enough natural light for the many plants. The rocks were collected one at a time on many beach walks. Gaze above, if you will, at a lovely sight indeed. This is the place where I have spent many pleasurable hours. Some special nights I sleep here, to the sounds of the surf, while watching the stars drift through the sky. I have solved many of the world's problems here, and then I go to sleep only to forget the solutions when I wake up! Looking west from the hammock on the oceanfront balcony. Spectacular colors: compliments of recent wildfire in the Temecula area. On August 29, 2003 after several months of completely remodeling this Del Mar ocean view condo, and in a brilliant display of planning, teamwork, and delegation, Mikie's Fun House #3 was moved to #4. Within 48 hours (surely a new world record) everything was packed, moved, unpacked, put in place, pictures hung, and most importantly, all cardboard boxes were gone. Carol handled everything from MFH #3, I directed arrivals into MFH #4 and installed the webcam and weather station, son Mike helped install the computers and get the new DSL line up, 4 professional movers supplied the grunt work, Lana helped with unpacking, and Teresa did the final cleaning. Congratulations and many thanks to all!